Even though a manufacturer might deliver a dozen pianos as a part of a batch, you can bet that five years down the line, none of them will sound alike to a trained piano musician’s ear. That’s because the voice, or tone, of the piano, depends on how often it’s played, the surroundings it’s kept in, and how it’s maintained. This is why musicians are never shy of calling particular pianos as mellow, sharp, sweet, or bright. Check out this piano owner’s manual and become equipped with the knowledge necessary to keep your piano playing as well as ever, for decades. Frequent and rather carefree use of the piano often dents the hammer felt. This causes hardening and grooving of the hammerheads, further leading to a loss of resilience, and deterioration of piano’s tone. To avoid, or correct this, look for professional servicemen with experience in ‘voicing’ the piano, which is nothing but treating the hammerheads and restoring them to original shape. This procedure involves improving the vibrations of every string, by altering the density of felt in every hammer, and even changing the hammer’s shape. It goes without saying, you need professionals to handle these services. When you play your piano often, the tension on the strings is affected. In some cases, this causes certain undesirable changes in the pitch of the piano’s sound. 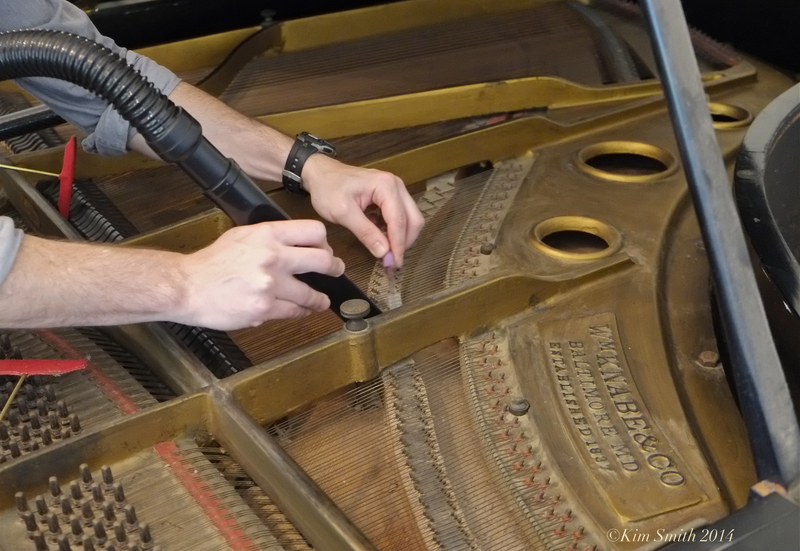 If you begin to observe changes in the pitch of your piano’s voice, it’s time to look for professional tuning services. Because of the wear and tear that the small mechanical parts of your piano are subjected to, some of them could get worn off, and lose their shape. The friction produced when the minute components move against each other affects the keys to a great extent. So, over a period of time, the keys of your piano could lose their alignment, and deteriorate your piano playing experience. However, professional piano servicemen have the acumen and equipment to re-align the parts of the piano. Your piano will begin to sound out of depth once its tuning is compromised. You’ll observe the notes to lack unison; plus, the pitch will be either too low or too high. To restore an out of tune piano, expert technicians work with every string and adjust its tuning pins till the pitch is right. Generally, a new piano needs to be tuned three times in the first year of its operations. After that, a couple of tunings per year suffice in keeping the pitch of the piano’s notes correct. During the decades of your ownership of your piano, you’d want it to be at its top game in terms of how it sounds. As you master the art of creating music on the piano, you don’t want your trusted ally to lose its class, voice, pitch, and aesthetic splendor, right? The solution – regular maintenance, and timely restorations and servicing from professionals. Take good care of your piano, and you can be sure that the pedals and the keys will remain faithful to the commands of your feet and fingers. Enjoy the sublime happiness of experimenting with different tempos, movements, and intensities of sounds, emanating from your piano, for the years to come. Pianos can be very demanding in terms of maintenance (in some ways though they can pretty reliable and simple – it all depends on your standards), not only technical but also aesthetic terms. You’d ideally want your cherished piece of sophisticated musical furniture to attract eyeballs and add aplomb to your house’s décor for many years. Use a woolen duster or a soft feather touch dirt remover to clean the piano. Be careful not to drag the dust grains across the piano, because they can leave scratches. Your brilliant shiny piano will begin to look dull if scratches continue to deface it (pretty hard to do if you are careful though). If you observe marks such as greasy fingerprints, grime, and stamps left behind on the piano by foreign objects kept on it, use a lightly damped cloth to clean them. Follow this up by rubbing the surface of the piano lightly with a dry cloth. For stubborn grime, use specialized piano cleaning products. Soundboards, plates, and strings should only be cleaned by professionals, so make it rule not to attempt the adventure of cleaning the interiors of the piano on your own. If you want to retain the glossy polyester finishing on the piano, dust it regularly, and carefully (twice a month is fine). With proper care, a piano can be a source of entertainment, learning and pleasure for many years. Treated properly, a piano can last for generations. Here are some basic guidelines to help you care for your piano. This entry was posted in Piano Care and tagged piano, piano care, piano tips. Music Lessons – How Much Talent Do You Need To Learn Music?